What does your box include? We want you to explore PMSBOX with no commitment. Click here to get your mini PMSBOX. After your first PMSBOX, you will get to customize your box and treat yourself to amazing products. 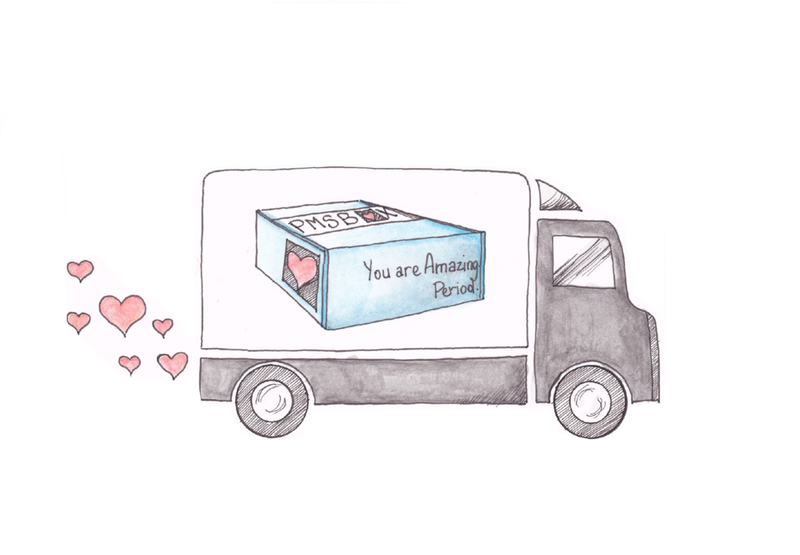 Your curated PMSBOX arrives at your door, right on time. Shipping included. Anytime you want, you can re-customize your box or skip a month. With each PMSBOX purchase, we give menstrual supplies to one person in need around the world. We are determined to end period poverty. Click here to learn more and support. “I am fortunate that when I was about to start having periods, my Mom was there to guide me through that milestone in my life and I had access to whatever supplies I needed to make an uncomfortable, messy, and sometimes painful menstrual experience as bearable as possible. Every menstruating person deserves to access to basic menstrual products and I am so inspired by PMSBOX’s mission to end period poverty. Not only is the mission of PMSBOX incredible, but so are the boxes themselves. Each item is organic, high-quality, and well thought out. From the variety of items included to the subtle but powerful details on the packaging, I loved every moment of unboxing my PMSBOX and look forward to seeing how these boxes improve the menstrual experiences of menstruating persons all over the world. Founder Sera Alper created PMSBOX with the aspiration of helping, caring, and inspiring menstruators to give back.